Antoninus Pius (Latin: Titus Fulvus Aelius Hadrianus Antoninus Augustus Pius; 19 September 86 CE – 7 March 161 CE), also known as Antoninus, was Roman Emperor from 138 to 161. He was one of the Five Good Emperors in the Nerva–Antonine dynasty and the Aurelii. He acquired the name Pius after his accession to the throne, either because he compelled the Senate to deify his adoptive father Hadrian, or because he had saved senators sentenced to death by Hadrian in his later years. He died of illness in 161 and was succeeded by his adopted sons Marcus Aurelius and Lucius Verus as co-emperors. He was born as the only child of Titus Aurelius Fulvus, consul in 89 whose family came from Nemausus (modern Nîmes). Titus Aurelius Fulvius was the son of a senator of the same name, who, as legate of Legio III Gallica, had supported Vespasian in his bid to the Imperial office and been rewarded with a suffect consulship, plus an ordinary one under Domitian in 85. The Aurelii Fulvii were therefore a relatively new senatorial family from Gallia Narbonensis whose rise to prominence was supported by the Flavians. The link between Antoninus' family and their home province explains the increasing importance of the post of Proconsul of Gallia Narbonensis during the late Second Century. Antoninus was born near Lanuvium and his mother was Arria Fadilla. Antoninus’ father died shortly after his 89 ordinary consulship, his son being raised by his maternal grandfather Gnaeus Arrius Antoninus, reputed by contemporaries to be a man of integrity and culture and a friend of Pliny the Younger. The Arrii Antoninii were an older senatorial family from Italy, very influential during Nerva's reign. Arria Fadilla, Antoninus' mother, married afterwards Publius Julius Lupus, a man of consular rank, suffect consul in 98, and two daughters, Arria Lupula and Julia Fadilla, were born from that union. Some time between 110 and 115, Antoninus married Annia Galeria Faustina the Elder. They are believed to have enjoyed a happy marriage. Faustina was the daughter of consul Marcus Annius Verus and Rupilia Faustina (a half-sister to Roman Empress Vibia Sabina). Faustina was a beautiful woman, and despite (basically unproven) rumours about her character, it is clear that Antoninus cared for her deeply. Marcus Aurelius Fulvus Antoninus (died before 138); his sepulchral inscription has been found at the Mausoleum of Hadrian in Rome. Marcus Galerius Aurelius Antoninus (died before 138); his sepulchral inscription has been found at the Mausoleum of Hadrian in Rome. His name appears on a Greek Imperial coin. Aurelia Fadilla (died in 135); she married Lucius Lamia Silvanus, consul 145. She appeared to have no children with her husband and her sepulchral inscription has been found in Italy. Annia Galeria Faustina Minor or Faustina the Younger (between 125–130–175), a future Roman Empress, married her maternal cousin, future Roman Emperor Marcus Aurelius in 146. When Faustina died in 141, Antoninus was greatly distressed. In honor of her memory, he asked the Senate to deify her as a goddess, and authorised the construction of a temple to be built in the Roman Forum in her name, with priestesses serving in her temple. He had various coins with her portrait struck in her honor. These coins were scripted ‘DIVA FAUSTINA’ and were elaborately decorated. He further created a charity which he founded and called it Puellae Faustinianae or Girls of Faustina, which assisted destitute girls  of good family. Finally, Antoninus created a new alimenta (see Grain supply to the city of Rome). After Faustina's death, he lived with a freed woman of hers named Galena Lysistrata instead of entering into a second marriage. 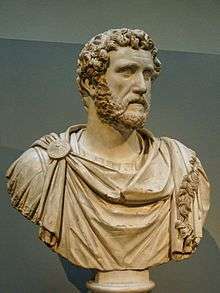 Concubinage was a form of getting female companionship preferred by some powerful men in Ancient Rome, especially widowers like Antoninus Pius, Vespasian before him and Marcus Aurelius after him. The woman would not produce any legitimate offspring who would threaten the previously established position as Antoninus' heirs of Marcus Aurelius and Lucius Verus. Also, as one could not have a wife and an official concubine (or two concubines) at the same time, Antoninus escaped the pressure of being pressed into a marriage with a woman from a powerful noble family (Later, Marcus Aurelius would also reject the advances of his former fiancee Ceionia Fabia, Lucius Verus's sister, on the grounds of protecting his children from a stepmother, and took a concubine instead). This relationship too appears to be cordial and she is known to have wielded great influence over him. Bust of Emperor Hadrian. Roman 117-138 CE. Probably From Rome, Italy. Formerly in the Townley Collection. Now housed in the British Museum, London. Having filled the offices of quaestor and praetor with more than usual success, he obtained the consulship in 120. He was next appointed by the Emperor Hadrian as one of the four proconsuls to administer Italia, then greatly increased his reputation by his conduct as proconsul of Asia, probably during 134–135. 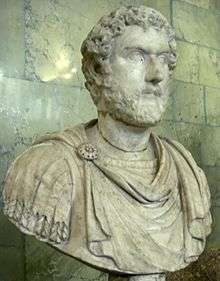 He acquired much favor with the Emperor Hadrian, who adopted him as his son and successor on 25 February 138, after the death of his first adopted son Lucius Aelius, on the condition that Antoninus would in turn adopt Marcus Annius Verus, the son of his wife's brother, and Lucius, son of Lucius Aelius, who afterwards became the emperors Marcus Aurelius and Lucius Verus. By this scheme, Verus, who was already Hadrian's adoptive grandson through his natural father, remained Hadrian's adoptive son through his new father. The adoption of Marcus Aurelius was probably a suggestion of Antoninus himself, since the former was the nephew of the latter's wife and would be his favorite son. Another version of the standardised imperial portrait; from the house of Jason Magnus at Cyrene, North Africa (British Museum). On his accession, Antoninus' name became "Imperator Caesar Titus Aelius Hadrianus Antoninus Augustus Pontifex Maximus". One of his first acts as Emperor was to persuade the Senate to grant divine honours to Hadrian, which they had at first refused; his efforts to persuade the Senate to grant these honours is the most likely reason given for his title of Pius (dutiful in affection; compare pietas). Two other reasons for this title are that he would support his aged father-in-law with his hand at Senate meetings, and that he had saved those men that Hadrian, during his period of ill-health, had condemned to death. Immediately after Hadrian's death, Antoninus approached Marcus and requested that his marriage arrangements be amended: Marcus' betrothal to Ceionia Fabia would be annulled, and he would be betrothed to Faustina, Antoninus' daughter, instead. Faustina's betrothal to Ceionia's brother Lucius Commodus would also have to be annulled. Marcus consented to Antoninus' proposal. There are no records of any military related acts in his time in which he participated. One modern scholar has written "It is almost certain not only that at no time in his life did he ever see, let alone command, a Roman army, but that, throughout the twenty-three years of his reign, he never went within five hundred miles of a legion". His reign was the most peaceful in the entire history of the Principate; notwithstanding the fact that there were several military disturbances throughout the Empire in his time. Such disturbances happened in Mauretania - where a senator was named as governor of Mauretania Tingitana in place of the usual equestrian procurator and cavalry reinforcements from Panonnia were brought in, towns such as Sala and Tipasa being fortified. Similar disturbances took place in Iudaea, and amongst the Brigantes in Britannia, none of them being considered serious. It was however in Britain that Antoninus decided to follow a new, more aggressive path, with the appointment of a new governor in 139, Quintus Lollius Urbicus a native of Numidia and previously governor of Germania Inferior. Under instructions from the emperor, Lollius undertook an invasion of southern Scotland, winning some significant victories, and constructing the Antonine Wall from the Firth of Forth to the Firth of Clyde. The wall, however, was soon gradually decommissioned during the mid-150s and eventually abandoned late during the reign (early 160s), for reasons that are still not quite clear. Antonine's Wall is mentioned in just one literary source, Antoninus' biography in the Historia Augusta. Pausanias makes a brief and confused mention of a war in Britain. In one inscription honoring Antoninus, erected by Legio II Augusta, which participated in the building of the Wall, a relief showing four naked prisoners, one of them beheaded, seems to stand for some actual warfare. Although Antonine's Wall was, in principle, much shorter and at first sight more defensible than Hadrian's Wall, the additional area that it enclosed within the Empire was barren, with the effect that supply lines to it were strained enough that the costs from maintaining the additional territory outweighed the benefits of doing so. It has been therefore speculated that the invasion of Lowland Scotland and the building of the wall had to do mostly with internal politics, that is, offering Antoninus an opportunity to gain some modicum of necessary military prestige at the start of his reign. Actually, the campaign in Britannia was followed by an Imperial salutation - that is, by Antoninus formally taking for the second (and last) time the title of Imperator - in 142. The fact that around the same time coins were struck announcing a victory in Britain points to Antoninus' need to publicize his achievements. The orator Fronto was later to say that, although Antoninus bestowed the direction of the British campaign to others, he should be regarded as the helmsman who directed the voyage, whose glory, therefore, belonged to him. There were also some troubles in Dacia Inferior which required the granting of additional powers to the procurator governor and the dispatchment of additional soldiers to the province. On the Northern Black Sea coast, the Greek city of Olbia was held against the Scythians. Also during his reign the governor of Upper Germany, probably Caius Popillius Carus Pedo, built new fortifications in the Agri Decumates, advancing the Limes Germanicus fifteen miles forward in his province and neighboring Raetia. In the East, Roman suzerainty over Armenia was retained by the 140 choosing of Arsacid scion Sohaemus as client king. Nevertheless, Antoninus was virtually unique among emperors in that he dealt with these crises without leaving Italy once during his reign, but instead dealt with provincial matters of war and peace through their governors or through imperial letters to the cities such as Ephesus (of which some were publicly displayed). This style of government was highly praised by his contemporaries and by later generations. Antoninus was the last Roman Emperor recognised by the Indian Kingdoms. Raoul McLaughlin quotes Aurelius Victor as saying " The Indians, the Bactrians and the Hyrcanians all sent ambassadors to Antoninus. They had all heard about the spirit of justice held by this great emperor, justice that was heightened by his handsome and grave countenance, and his slim and vigorous figure." Due to the outbreak of the Antonine epidemic and wars against northern Germanic tribes, the reign of Marcus Aurelius was forced to alter the focus of foreign policies and matters of the Far East was increasingly abandoned in favour of those directly concerning the Empire's survival. Antoninus was regarded as a skilled administrator and as a builder. In spite of an extensive building directive - the free access of the people of Rome to drinking water was expanded with the construction of aqueducts, not only in Rome but throughout the Empire, as well as bridges and roads, the Emperor still managed to leave behind a sizable public treasure of around two and a half million sesterces (Rome would not witness another Emperor leaving his successor with a surplus for a long time. But this treasure was depleted almost immediately after Antoninus's reign due to the plagues the troops brought back after the Parthian victory). The Emperor also famously suspended the collection of taxes from cities affected by natural disasters, such as when fires struck Rome and Narbona, and earthquakes affected Rhodes and the Province of Asia. He offered hefty financial grants for rebuilding and recovery of various Greek cities after two serious earthquakes: the first, circa 140, which affected mostly Rhodes and other islands; the second, in 152, which hit Cyzicus - where the huge and newly built Temple to Hadrian was destroyed - Ephesus and Smyrna. Antoninus' financial help earned him praise by Greek writers such as Aelius Aristides and Pausanias. 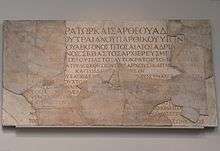 These cities received from Antoninus the usual honorific accolades, such as when he commended that all governors of Asia should enter the province, when taking office, by way of Ephesus. Ephesus was specially favoured by Antoninus, who confirmed and upheld its first place in the list of imperial honor titles, as opposed to Smyrna and Pergamon. In his dealings with Greek-speaking cities, Antoninus followed the policy adopted by Hadrian of ingratiating himself with local elites, specially with local intellectuals: philosophers, teachers of literature, rhetoricians and physicians were explicitly exempted from any duties involving private spending for civic purposes - a privilege granted by Hadrian that Antoninus confirmed by means of an edict preserved in the Digest (27.1.6.8). Antoninus also created a chair for the teaching of rhetoric in Athens. Antoninus was known as an avid observer of rites of religion and of formal celebrations - both Roman and foreign. He is known for having increasingly formalized the official cult offered to the Great Mother, which from his reign onwards included a bull sacrifice, a taurobolium, formerly only a private ritual, now being also performed for the sake of the Emperor's welfare. Antoninus also offered patronage to the worship of Mithra, to whom he erected a temple in Ostia. In 148, he presided over the celebrations of the 900th anniversary of the founding of Rome. Antoninus tried to portray himself as a magistrate of the res publica, no matter how extended and ill-defined his competences were: therefore the fact that he is credited with the splitting of the imperial treasure, the Fiscus. This splitting had to do with the division of Imperial properties into two parts: firstly, the fiscus itself-or patrimonium, meaning the properties of the "Crown", the hereditary properties of each succeeding person that sat on the throne, transmitted to his successors in office, regardless of their being members of the imperial family or not; secondly, the res privata, the "private" properties tied to the personal maintenance of the Emperor and his family. An anecdote in the Historia Augusta biography, where Antoninus replies to Faustina - who complained about his stinginess - that "we have gained an empire [and] lost even what we had before" possibly relates to Antoninus' actual concerns at the creation of the res privata. While still a private citizen, Antoninus had increased his personal fortune greatly by mean of various legacies, the consequence - we are told - of his caring scrupulously for his relatives. The res privata lands could be sold and/or given away, while the patrimonium properties were regarded as public. It was a way of pretending that the Imperial function - and most properties attached to it - was a public one, formally subject to the authority of the Senate and the Roman people. That the distinction played no part in subsequent political history - that the personal power of the princeps absorbed his role as office-holder - proves that the autocratic logic of the imperial order had already subsumed the old republican institutions. Of the public transactions of this period there is only the scantiest of information, but, to judge by what is extant, those twenty-two years were not remarkably eventful in comparison to those before and after the reign. However, Antoninus did take a great interest in the revision and practice of the law throughout the empire. One of his chief concerns was to having local communities conform their legal procedures to existing Roman norms: in a case concerning repression of banditry by local police officers ("irenarchs") in Asia Minor, Antoninus ordered that these officers should not treat suspects as already condemned, and also keep a detailed copy of their interrogations,to be used in the possibility of an appeal to the Roman governor. Also, although Antoninus was not an innovator, he would not always follow the absolute letter of the law; rather he was driven by concerns over humanity and equality, and introduced into Roman law many important new principles based upon this notion. In this, the emperor was assisted by five chief lawyers: L. Fulvius Aburnius Valens, an author of legal treatises; L. Ulpius Marcellus, a prolific writer; and three others . These last three included L. Volusius Maecianus, a former military officer turned by Antoninus into a civil procurator, and who, in view of his subsequent career (discovered on the basis of epigraphical and prosopographical research) was the Emperor's most important legal adviser. Maecianus would eventually be chosen to occupy various prefectures (see below) as well as to conduct the legal studies of Marcus Aurelius. He was also the author of a large work on Fidei Commissa (Testamentary Trusts). As a hallmark of the increased connection between jurists and the imperial government, Antoninus' reign also saw the appearance of the Institutes of Gaius, an elementary legal manual for beginners (see Gaius (jurist)). Antoninus passed measures to facilitate the enfranchisement of slaves. Mostly, he favoured the principle of favor libertatis, giving the putative freedman the benefit of the doubt when the claim to freedom was not clearcut. Also, he punished the killing of a slave by his/her master without previous trial and determined that slaves could be forcibly sold to another master by a proconsul in cases of consistent mistreatment. Antoninus upheld the enforcement of contracts for selling of female slaves forbidding their further employment in prostitution. In criminal law, Antoninus introduced the important principle that accused persons are not to be treated as guilty before trial- as in the case of the irenarchs (see above). He also asserted the principle that the trial was to be held, and the punishment inflicted, in the place where the crime had been committed. He mitigated the use of torture in examining slaves by certain limitations. Thus he prohibited the application of torture to children under fourteen years, though this rule had exceptions. However, it must be stressed that Antoninus extended, by means of a rescript, the use of torture as a means of obtaining evidence to pecuniary cases, when it had been applied up until then only in criminal cases. Also, already at the time torture of free men of low status (humiliores) had become legal, as proved by the fact that Antoninus exempted town councillors expressly from it, and also free men of high rank (honestiores) in general. One highlight during his reign occurred in 148, with the nine-hundredth anniversary of the foundation of Rome being celebrated by the hosting of magnificent games in Rome. It lasted a number of days, and a host of exotic animals were killed, including elephants, giraffes, tigers, rhinoceroses, crocodiles and hippopotami. While this increased Antoninus’s popularity, the frugal emperor had to debase the Roman currency. He decreased the silver purity of the denarius from 89% to 83.5% — the actual silver weight dropping from 2.88 grams to 2.68 grams. Scholars place Antoninus Pius as the leading candidate for fulfilling the role as a friend of Rabbi Judah the Prince. According to the Talmud (Avodah Zarah 10a-b), Rabbi Judah was very wealthy and greatly revered in Rome. He had a close friendship with "Antoninus", possibly Antoninus Pius, who would consult Rabbi Judah on various worldly and spiritual matters. 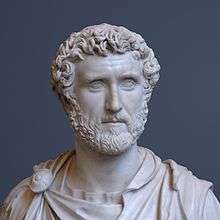 In 156, Antoninus Pius turned 70. He found it difficult to keep himself upright without stays. He started nibbling on dry bread to give him the strength to stay awake through his morning receptions. Marcus Aurelius had already been created consul with Antoninus in 140, receiving the title of Caesar - i.e., heir apparent. As Antoninus aged, Marcus would take on more administrative duties, more still after the death -in 156 or 157 - of one of Antoninus' most trusted advisers, Gavius Maximus, who had been praetorian prefect (an office that was as much secretarial as military) for twenty years. Gavius Maximus, who had been one of the most important members of Antoninus' "team" of long standing advisers, had been awarded with the consular insignia and to the honors due to a senator. He had left behind himself the reputation of being a most strict disciplinarian (vir severissimus, according to Historia Augusta) as well as some lasting grudges among fellow equestrian procurators- one of them, by predeceasing Gavius and vilifying him in his will, created a serious embarrassment to one of the heirs, the orator Fronto. Gavius Maximus' death offered the opportunity to a welcome change in the ruling team, and it has been speculated that it was the legal adviser Volusius Maecianus - who, after a brief spell as Praefect of Egypt, took the office of Praefectus annonae in Rome - who assumed the role of grey eminence precisely in order to prepare the incoming - and altogether new - joint succession. In 160, Marcus and Lucius were designated joint consuls for the following year. Perhaps Antoninus was already ill; in any case, he died before the year was out. Two days before his death, the biographer reports, Antoninus was at his ancestral estate at Lorium, in Etruria, about twelve miles (19 km) from Rome. He ate Alpine cheese at dinner quite greedily. In the night he vomited; he had a fever the next day. The day after that, 7 March 161, he summoned the imperial council, and passed the state and his daughter to Marcus. The emperor gave the keynote to his life in the last word that he uttered when the tribune of the night-watch came to ask the password—"aequanimitas" (equanimity). He then turned over, as if going to sleep, and died. His death closed out the longest reign since Augustus (surpassing Tiberius by a couple of months). Antoninus Pius' funeral ceremonies were, in the words of the biographer, "elaborate". If his funeral followed the pattern of past funerals, his body would have been incinerated on a pyre at the Campus Martius, while his spirit would rise to the gods' home in the heavens. However, it seems that this was not the case: according to his Historia Augusta biography (which seems to reproduce an earlier, detailed report) Antoninus' body (and not his ashes) was buried in Hadrian's mausoleum. After a seven-day interval (justitium), Marcus and Lucius nominated their father for deification. In contrast to their behavior during Antoninus' campaign to deify Hadrian, the senate did not oppose the emperors' wishes. A flamen, or cultic priest, was appointed to minister the cult of the deified Antoninus, now Divus Antoninus. A column was dedicated to Antoninus on the Campus Martius, and the temple he had built in the Forum in 141 to his deified wife Faustina was rededicated to the deified Faustina and the deified Antoninus. It survives as the church of San Lorenzo in Miranda. The first group of people claiming to be an ambassadorial mission of Romans to China was recorded in 166 AD by the Hou Hanshu. The embassy came to Emperor Huan of Han China from "Andun" (Chinese: 安敦; Emperor Antoninus Pius), "king of Daqin" (Rome). As Antoninus Pius died in 161, leaving the empire to his adoptive son Marcus Aurelius (Antoninus), and the envoy arrived in 166, confusion remains about who sent the mission given that both Emperors were named 'Antoninus'. The Roman mission came from the south (therefore probably by sea), entering China by the frontier province of Jiaozhi at Rinan or Tonkin (present-day northern Vietnam). It brought presents of rhinoceros horns, ivory, and tortoise shell, probably acquired in Southern Asia. The text specifically states that it was the first time there had been direct contact between the two countries. 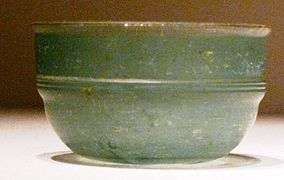 Furthermore, a Republican-era Roman glassware has been found at a Western Han tomb in Guangzhou along the South China Sea, dated to the early 1st century BC. Roman golden medallions made during the reign of Antoninus Pius and perhaps even Marcus Aurelius have been found at Óc Eo in southern Vietnam, then part of the Kingdom of Funan near the Chinese province of Jiaozhi. This may have been the port city of Kattigara, described by Ptolemy (c. 150) as being visited by a Greek sailor named Alexander and laying beyond the Golden Chersonese (i.e. Malay Peninsula). Roman coins from the reigns of Tiberius to Aurelian have been discovered in Xi'an, China (site of the Han capital Chang'an), although the significantly greater amount of Roman coins unearthed in India suggest the Roman maritime trade for purchasing Chinese silk was centered there, not in China or even the overland Silk Road running through ancient Iran. Arch of Antoninus Pius in Sbeïtla, Tunisia. The only intact account of his life handed down to us is that of the Augustan History, an unreliable and mostly fabricated work. Nevertheless, it still contains information that is considered reasonably sound – for instance, it is the only source that mentions the erection of the Antonine Wall in Britain. Antoninus is unique among Roman emperors in that he has no other biographies. Historians have therefore turned to public records for what details we know. A few months afterwards, on Hadrian's death, he was enthusiastically welcomed to the throne by the Roman people, who, for once, were not disappointed in their anticipation of a happy reign. For Antoninus came to his new office with simple tastes, kindly disposition, extensive experience, a well-trained intelligence and the sincerest desire for the welfare of his subjects. Instead of plundering to support his prodigality, he emptied his private treasury to assist distressed provinces and cities, and everywhere exercised rigid economy (hence the nickname κυμινοπριστης "cummin-splitter"). Instead of exaggerating into treason whatever was susceptible of unfavorable interpretation, he turned the very conspiracies that were formed against him into opportunities for demonstrating his clemency. Instead of stirring up persecution against the Christians, he extended to them the strong hand of his protection throughout the empire. Rather than give occasion to that oppression which he regarded as inseparable from an emperor's progress through his dominions, he was content to spend all the years of his reign in Rome, or its neighbourhood. however estimable the man, Antoninus was hardly a great statesman. The rest which the Empire enjoyed under his auspices had been rendered possible through Hadrian’s activity, and was not due to his own exertions; on the other hand, he carried the policy of peace at any price too far, and so entailed calamities on the state after his death. He not only had no originality or power of initiative, but he had not even the insight or boldness to work further on the new lines marked out by Hadrian. German historian Ernst Kornemann has had it in his Römische Geschichte [2 vols., ed. by H. Bengtson, Stuttgart 1954] that the reign of Antoninus comprised "a succession of grossly wasted opportunities," given the upheavals that were to come. There is more to this argument, given that the Parthians in the East were themselves soon to make no small amount of mischief after Antoninus' passing. Kornemann's brief is that Antoninus might have waged preventive wars to head off these outsiders. Micheal Grant agrees that it is possible that had Antoninus acted decisively sooner (it appears on his death bed, he was preparing a large scale action against the Parthians), the Parthians might have been unable to choose their own time, but current evidences are not conclusive. Grant opines that Antoninus and his officers did act in a resolute manner dealing with frontier disturbances of his time, although conditions for long lasting peace were not created. 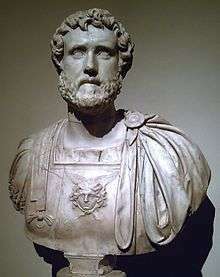 On the whole, according to Grant, Marcus Aurelius' eulogistic picture of Antoninus seems deserved, and Antonius appears to have been a conservative and nationalistic (although he respected and followed Hadrian's example of Philhellenism moderately) Emperor who was not tainted by the blood of either citizen or foe, combined and maintained Numa Pompilius' good fortune, pacific dutifulness and religious scrupulousness, and whose laws removed anomalies and soften harshnesses. Krzysztof Ulanowski argues that the claims of military inability is exaggerated, considering that although the sources praise Antoninus' love for peace and his efforts 'rather to defend, than enlarge the provinces', he could hardly be considered a pacifist, as shown by the conquest of the Lowlands, the building of the Antonine Wall and the expansion of Germania Superior. Ulianowski also praises Antoninus for being successful in deterrence by diplomatic means. Although only one of his four children survived to adulthood, Antoninus came to be ancestor to generations of prominent Roman statesmen and socialites, including at least one empress consort and as the maternal grandfather of the Emperor Commodus. The family of Antoninus Pius and Faustina the Elder also represents one of the few periods in ancient Roman history where the position of Emperor passed smoothly from father to son. Direct descendants of Antoninus and Faustina were confirmed to exist at least into the fifth century AD. ↑ Sister of Trajan's father: Giacosa (1977), p. 7. 1 2 Levick (2014), p. 161. ↑ Husband of Ulpia Marciana: Levick (2014), p. 161. 1 2 Giacosa (1977), p. 7. 1 2 3 DIR contributor (Herbert W. Benario, 2000), "Hadrian". 1 2 Giacosa (1977), p. 9. ↑ Husband of Salonia Matidia: Levick (2014), p. 161. ↑ Smith (1870), "Julius Servianus". ↑ Smith (1870), "Hadrian", pp. 319–322. ↑ Lover of Hadrian: Lambert (1984), p. 99 and passim; deification: Lamber (1984), pp. 2-5, etc. ↑ Julia Balbilla a possible lover of Sabina: A. R. Birley (1997), Hadrian, the Restless Emperor, p. 251, cited in Levick (2014), p. 30, who is sceptical of this suggestion. ↑ Husband of Rupilia Faustina: Levick (2014), p. 163. 1 2 3 4 Levick (2014), p. 163. 1 2 3 4 Levick (2014), p. 162. 1 2 3 4 5 6 7 Levick (2014), p. 164. ↑ Wife of M. Annius Verus: Giacosa (1977), p. 10. ↑ Wife of M. Annius Libo: Levick (2014), p. 163. 1 2 3 4 5 Giacosa (1977), p. 10. ↑ Husband of Ceionia Fabia: Levick (2014), p. 164. 1 2 3 Levick (2014), p. 117. ↑ In Classical Latin, Antoninus' name would be inscribed as TITVS AELIVS HADRIANVS ANTONINVS AVGVSTVS PIVS. ↑ Vagi, David L. (2000). Coinage and History of the Roman Empire, C. 82 B.C.--A.D. 480: History. Taylor & Francis. p. 240. ISBN 9781579583163. ↑ Strong, Anise K. (2016). Prostitutes and Matrons in the Roman World. Cambridge University Press. p. 85. ISBN 9781107148758. ↑ Lind, Goran (2008). Common Law Marriage: A Legal Institution for Cohabitation. Oxford University Press. p. 72. ISBN 9780199710539. ↑ Birley, Anthony R (2012). Marcus Aurelius: A Biography. Routledge. p. 33. ISBN 9781134695690. ↑ HA Marcus 6.2; Verus 2.3–4; Birley, Marcus Aurelius, 53–54. ↑ J. J. Wilkes, The Journal of Roman Studies, Volume LXXV 1985, ISSN 0075-4358, p. 242. ↑ Michel Christol, "L'armée des provinces pannoniennes et la pacification des révoltes maures sous Antonin le Pieux". In: Antiquités africaines, 17, 1981. pp. 133-141. ↑ Michael Grant, The Antonines: The Roman Empire in Transition. Abingdon: Routledge, 1996, ISBN 0-415-13814-0, page 17; Rebuffat "Enceintes urbaines"
↑ McLaughlin, Raoul (2010). Books on Google Play. Rome and the Distant East: Trade Routes to the Ancient Lands of Arabia, India and China. A&C Black. p. 131. ISBN 9781847252357. ↑ Allen, Timothy F. H.; Hoekstra, Thomas W.; Tainter, Joseph A. (2012). Supply-Side Sustainability. Columbia University Press. pp. 105–106. ISBN 9780231504072. ↑ E.E. Bryant, The Reign of Antoninus Pius. Cambridge University Press: 1895, pages 45/46 and 68. ↑ Samuel Dill, Roman Society from Nero to Marcus Aurelius. Library of Alexandria, s.d.g. ↑ Oxford Classical Dictionary, London: 2012, ISBN 978-0-19-954556-8, entry "Patrimonium". ↑ Aubert, Jean-Jacques. "L’esclave en droit romain ou l’impossible réification de l’homme." Esclavage et travail forcé, Cahiers de la Recherche sur les droits fondamentaux (CRDF). Vol. 10. 2012. ↑ A. Mischcon, Abodah Zara, p.10a Soncino, 1988. Mischcon cites various sources, "SJ Rappaport... is of opinion that our Antoninus is Antoninus Pius." Other opinions cited suggest "Antoninus" was Caracalla, Lucius Verus or Alexander Severus. ↑ Geoffrey William Adams, Marcus Aurelius in the Historia Augusta and Beyond. Lanham: Rowman & Littlefield, 2013, ISBN 978-0-7391-7638-2, pages 74/75. ↑ Dio 71.33.4–5; Birley, Marcus Aurelius, 114. ↑ HA Antoninus Pius 12.4–8; Birley, Marcus Aurelius, 114. ↑ HA Marcus 7.10, tr. David Magie, cited in Birley, Marcus Aurelius, 118, 278 n.6. ↑ Birley, Marcus Aurelius, 118. 1 2 3 For a full translation of that passage, see: Paul Halsall (2000) . Jerome S. Arkenberg, ed. "East Asian History Sourcebook: Chinese Accounts of Rome, Byzantium and the Middle East, c. 91 B.C.E. - 1643 C.E.". Fordham.edu. Fordham University. Retrieved 2016-09-17. ↑ Yü, Ying-shih. (1986). "Han Foreign Relations," in Denis Twitchett and Michael Loewe (eds), The Cambridge History of China: Volume I: the Ch'in and Han Empires, 221 B.C. – A.D. 220, 377-462, Cambridge: Cambridge University Press, pp. 460–461, ISBN 978-0-521-24327-8. ↑ de Crespigny, Rafe (2007), A Biographical Dictionary of Later Han to the Three Kingdoms (23–220 AD), Leiden: Koninklijke Brill, p. 600, ISBN 978-90-04-15605-0. ↑ Pulleyblank, Edwin G.; Leslie, D. D.; Gardiner, K. H. J. (1999). "The Roman Empire as Known to Han China". Journal of the American Oriental Society. 119 (1): 71–79. doi:10.2307/605541. JSTOR 605541. ↑ Hill (2009), p. 27 and nn. 12.18 and 12.20. ↑ Hill (2009), p. 27. ↑ An, Jiayao. (2002), "When Glass Was Treasured in China," in Annette L. Juliano and Judith A. Lerner (eds), Silk Road Studies VII: Nomads, Traders, and Holy Men Along China's Silk Road, 79–94, Turnhout: Brepols Publishers, ISBN 2503521789, p. 83. 1 2 For further information on Oc Eo, see Milton Osborne (2006), The Mekong: Turbulent Past, Uncertain Future, Crows Nest: Allen & Unwin, revised edition, first published in 2000, ISBN 1-74114-893-6, pp 24-25. ↑ Warwick Ball (2016), Rome in the East: Transformation of an Empire, 2nd edition, London & New York: Routledge, ISBN 978-0-415-72078-6, p. 154. ↑ Gibbon, Edward (2015). Delphi Complete Works of Edward Gibbon (Illustrated). Delphi Classics. p. 125. ISBN 9781910630761. ↑ Chrisholm, Hugh (1911). The Encyclopaedia Britannica: A Dictionary of Arts, Sciences, Literature and General Information, Volumes 1-2. University Press. p. 149. ↑ Grant, Michael (2016). The Antonines: The Roman Empire in Transition. Routledge. pp. 14–23. ISBN 9781317972112. ↑ Ulanowski, Krzysztof (2016). The Religious Aspects of War in the Ancient Near East, Greece, and Rome: Ancient Warfare Series, Volume 1. BRILL. pp. 360–361. ISBN 9789004324763. ↑ Martindale, John Robert, John Morris, and Arnold Hugh Martin Jones, "Anicius Probus 7", The Prosopography of the Later Roman Empire, Volume 2, Cambridge University Press, p. 911. Historia Augusta, The Life of Antoninus Pius, English version of Historia Augusta Note that the Historia Augusta includes pseudohistorical elements. Weigel, Richard D. "Antoninus Pius (A.D. 138–161) De Imperatoribus Romanis". Bowman, Alan K. (2000). The Cambridge Ancient History: The High Empire, A.D. 70–192. Cambridge University Press. Birley, Anthony (2000). Marcus Aurelius. Routledge. Canduci, Alexander (2010). Triumph & Tragedy: The Rise and Fall of Rome's Immortal Emperors. Pier 9. ISBN 978-1-74196-598-8. Bury, J. B. (1893). A History of the Roman Empire from its Foundation to the Death of Marcus Aurelius. Harper. Hüttl, W. (1936) . 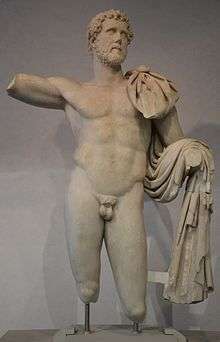 Antoninus Pius. I & II, Prag. Watson, P. B. (1884). "ii". Marcus Aurelius Antoninus. London.